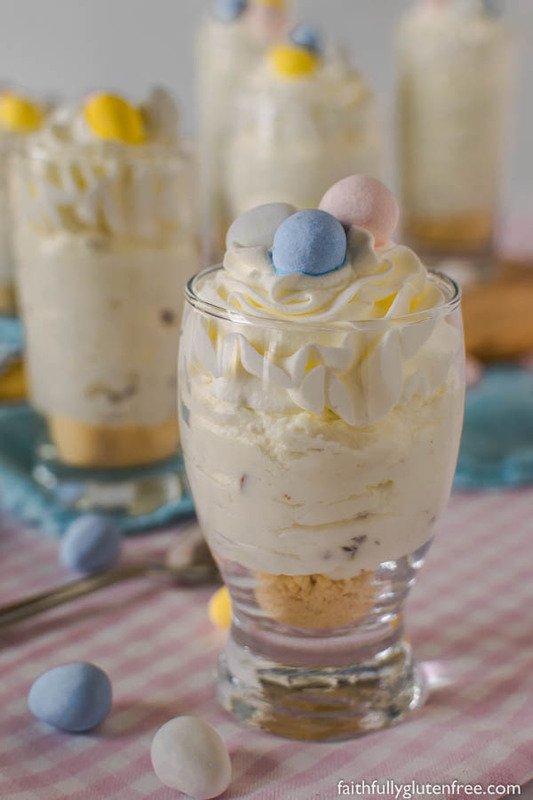 Gluten free No Bake Mini Egg Cheesecakes will rescue you if you’re stuck looking for a last minute Easter dessert. Make them in individual jars or glasses, they can be ready in less than 30 minutes. With it being Easter this weekend, you might be searching for a last minute dessert to bring to a gathering, or a quick dessert to enjoy at home. Whatever your circumstances are, these gluten free No Bake Mini Egg Cheesecakes are the answer. Since these individual no bake cheesecakes are made in cups, there is no waiting for them to set up before serving, and very little prep required to get them that far. The recipe as written makes 6-8 servings, depending on the size of your glassware. You can use shot glasses, small juice glasses, or even small canning jars to prepare them in. As for the cookie crust – the choice is yours. You can completely omit it if you want, or you can substitute the gluten free cookies with pretzels for a nice salty crust. Use whatever you have on hand. I don’t think the crust needs to be held together like a freestanding cheesecake, so I don’t bother with adding more sugar and butter to help hold it together. I like it to just be loose crumbs, that way it is easier to scoop out while you are eating the silky smooth cheesecake. 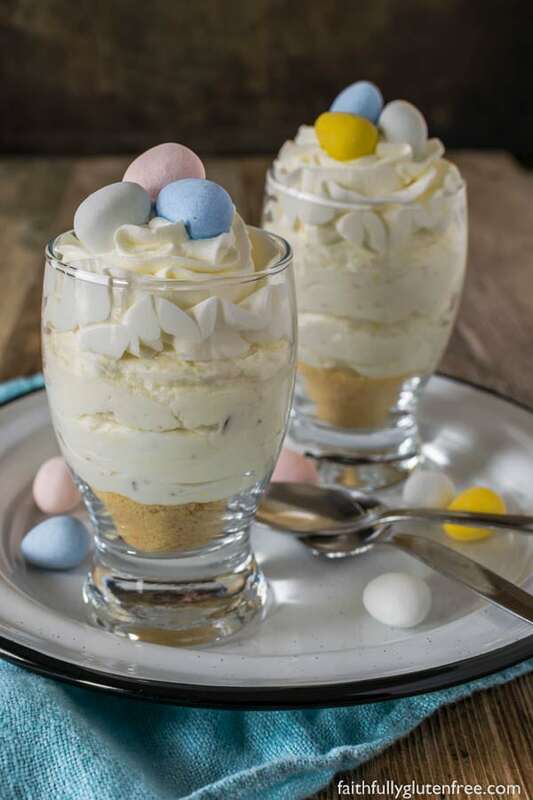 These gluten free No Bake Mini Egg Cheesecakes are not super sweet – the flavour of the cream cheese really comes through. If you want it to be a little sweeter, I would add an additional 1/4 cup Mini Eggs. The chocolate Mini Eggs that I use are Eggies from Hershey’s. They do not specify that they are gluten free, but they also do not list gluten as an allergen, and Hershey’s has always been very good with labeling any allergens on their labels. 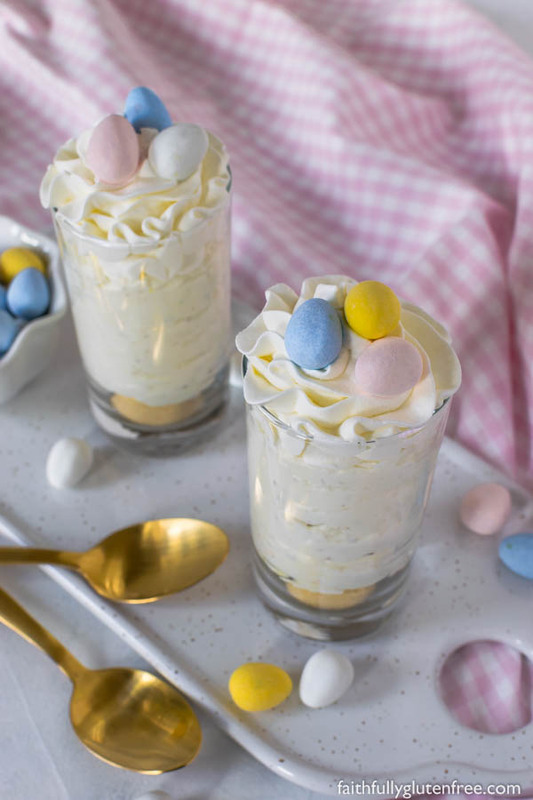 Gluten free No Bake Mini Egg Cheesecakes will rescue you if you're stuck looking for a last minute Easter dessert. Make them in individual jars or glasses, they can be ready in less than 30 minutes. Find clear glass containers to make the cheesecakes in. The glasses should be between 4-6 ounces each. Spoon about 2 tablespoons of the cookie crumbs into the bottom of each glass. Give the glass a quick shake to help level the crumbs. Using an electric beater, beat the whipping cream until still peaks form. Set aside. In another bowl, beat together the cream cheese, sugar, yogurt, and vanilla. Fold in approximately 2/3 of the whipped cream into the cream cheese mixture. The remaining 1/3 will be used to pipe on top of the cheesecakes. Measure out 1/2 cup Mini Eggs and place them in a heavy plastic bag. Use a mallet, hammer, or heavy pan to smash the Mini Eggs into small pieces. I placed the bag on a heavy cutting board so that I wouldn't accidentally damage my counter top in the process. Using a rubber scraper, stir the broken Mini Eggs into the cream cheese mixture. The easiest, cleanest way to fill the glasses is by putting the cream cheese mixture into a piping bag or large zipper seal bag. Cut the tip off, and pipe the cream cheese mixture on top of the crumb crust. Divide the mixture evenly between the glasses. Pipe or dollop the remaining whipped cream on top of the cream cheese mixture. Refrigerate until ready to serve. Right before serving, garnish each Mini Egg cheesecake with additional chocolate Mini Eggs. Thanks, Sunny! I’ve never heard of that app, I’ll need to look into it. Happy Easter! Hi Jeanine, These look sooo cute! And delicious! We’re going to make them for our Easter dessert. 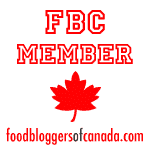 Because of our daughter’s diet problems, we will leave out the crumbs and the eggs. But that’s okay. Thank you for sharing. Have a wonderful Easter, Jeanne!! 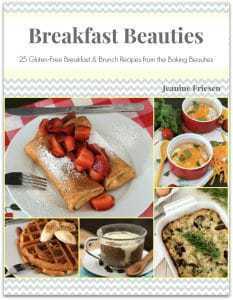 Thanks, for your suggestions, Jeanine! I hadn’t thought about needing to add a sweetener! We can add blueberries – they’re one of the few fruits she can eat. Lemon are kiwi are too acid-y. Thankfully, she doesn’t have to be dairy free. I’ll send an email and explain…. Thanks again. I’d love to hear from you again! Tell me about your Easter. Hope you were able to adjust this for your daughter, Jeanne! We had a great Easter this year – church & a BBQ, even though the weather wasn’t very agreeable in Manitoba.